September 26, 2011 - Eurocopter’s strong presence in the UK multi-mission helicopter marketplace will be demonstrated at the Helitech 2011 show and conference, which is to include this event’s first appearance of the EC145 T2 the company’s new generation version of its workhorse twin-engine EC145. During the September 27-29 Helitech show at Duxford Airport, the EC145 T2 will be exhibited on Eurocopter’s stand (#906), joined by EC120, AS350 B3, EC130, EC135 and EC155 helicopters within the static display area. The Eurocopter EC145 is a twin-engine light utility helicopter manufactured by Eurocopter. 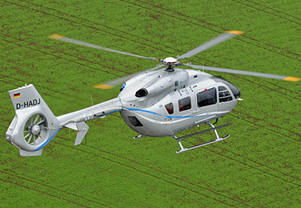 Originally referred to as the BK 117 C2, the EC145 is based upon the MBB/Kawasaki BK 117 C1. This became a part of the Eurocopter line-up in 1992 when the company was formed through the merger of the Messerschmitt-Bolkow-Blohm helicopter division of Daimler-Benz and the helicopter division of Aérospatiale-Matra. The EC145 is a twin-engine aircraft and can carry up to nine passengers along with two crew, depending on customer configuration. The helicopter is marketed for passenger transport, corporate transport, emergency medical services (EMS), search and rescue, parapublic and utility roles. The enhanced EC145 T2 represents Eurocopter’s evolution strategy that is being implemented across its product line for improved operating performance, efficiency and maintainability. This rotary-wing aircraft incorporates new Arriel 2E engines, along with Eurocopter’s Fenestron shrouded tail rotor, upgraded main and tail rotor gear boxes, an innovative new digital avionics suite and a 4-axis autopilot. The EC145 T2 to be showcased at Helitech 2011 features the latest multi-mission configuration, highlighting the flexibility of its spacious cabin and the new avionics. Also spotlighted at Helitech will be a 1/5th scale model of Eurocopter’s X3 hybrid demonstrator, which combines the excellent vertical takeoff and landing capabilities of a helicopter with aircraft-type fast cruise speeds. The X³ has flown at speeds of more than 220 kts., confirming how this concept will provide extremely productive solutions to a wide range of missions including long-distance search and rescue, coast guard duties, border patrol missions, passenger transport, offshore operations and inter-city shuttle services. An overview of how the X³ is contributing to Eurocopter’s innovation roadmap will be provided at Helitech during a conference with Jean-Michel Billig, the Eurocopter Vice President of Engineering, to be held Thursday, September 28, at 2:40 p.m. in the Airspace Conference Center. Eurocopter has a strong – and growing – presence across the British Isles. Servicing some 700 helicopters in the marketplace and 1,700 employees based in England, Scotland, Wales and Ireland, the company has become a vital element in the UK national helicopter infrastructure. It offers a full range of activities including sales, design and installation, training, support and other services for customers in the civil, military, oil and gas, parapublic and defense markets. With more than 100 helicopters in service with the UK armed forces, Eurocopter is a vital part of its defense, security and rescue infrastructure. The company’s acquisition this year of Vector Aerospace equally contributes to position Eurocopter as a key military MRO (maintenance, repair and overhaul) player for the UK armed forces. “Here in Duxford, here in UK, we are proud to demonstrate how Eurocopter daily serves this country, its government and its citizens with our proven products, our power of innovation and affordable service solutions,” said Markus Steinke, the Managing Director Eurocopter UK Ltd. Established in 1992, the Franco-German-Spanish Eurocopter Group a division of EADS, a world leader in aerospace, defense and related services. The Eurocopter Group employs approximately 17,500 people. In 2010, Eurocopter confirmed its position as a helicopter manufacturer in the civil and parapublic market with a turnover of 4.8 billion Euros, orders for 346 new helicopters and a 49 percent market share in the civil and parapublic sectors.